Excellent post. I had always noticed that 5 and 6 seem to come up the most (so should be left towards the end of the game) and it's interesting to see some statistical validation. 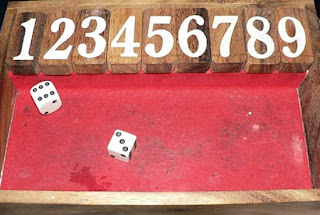 Except that the rules of the game state that once 7,8 and 9 have been lifted, the player may only use one die. Therefore it's a good idea to try to keep 7 as long as possible, so that two dice can be used. Ideally 7 should be the last number as there are 3 combinations that roll 7. Once the player can only play with one die, each number only has a 1:6 chance. I have heard that the rules of the game can differ and perhaps the rules you mention are the original rules, however I only describe how it is being played in Phuket, ie. with two dice all the time. I think these rules are used elsewhere in Thailand too, but I am unable to really confirm that with certainty. I've always found that if I work from the outside in I have greater success. For example going for a 1 or a 9 or a 2 or an 8, then you only are relying on single digit dice for a "jackpot". 7 shouts in half an hour wasn't too bad at Kangaroo Bar in Patong.